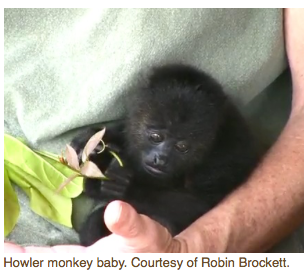 Robin Brockett, former director of the Wildlife Care Center in Belize, talks about howler monkeys in Belize. 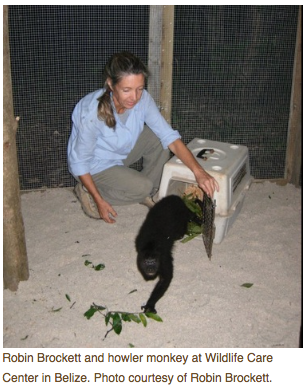 She tells “The WildLife” host Laurel Neme how her research into their diet and habits has helped her with rehabilitate howler monkeys captured as pets for release back into the wild. Howler monkeys are the loudest land animal in the world. They’re known for their loud, guttural, barking howls, which can be heard over three miles away. But did you know that they smell like steeped black tea? Or that they are picky eaters? While howler monkeys in Belize will eat 75 different species of leaves, they’re very particular about the age of the leaves. There are only a few types of leaves they’ll eat year-round. For example, (ficus) fig leaves appear the same all year long but sometimes the howlers will avoid it. That’s because these leaves have a high latex content, and at some point it becomes less palatable and less digestible.